MDGx Win10 Block Tools (10_BLOCK) [44.29 KB, ZIPped archive, free, unsupported]. Brief Guide ➜ must view 1st! 10_BLOCK.TXT = This ReadMe Text (TXT) Guide ➜ must view 1st! 10_BLOCK.CMD = Batch Command (CMD) file. E10BLOK.CMD = Batch Command (CMD) file. ELEVAT64.EXE = Elevate 64-bit command line tool ➜ runs 10_BLOCK.CMD as Administrator on 64-bit (x64) Windows OSes. ELEVATE.EXE = Elevate 32-bit command line tool ➜ runs 10_BLOCK.CMD as Administrator on 32-bit (x86) Windows OSes. ELEVATE.TXT = Text (TXT) Guide for ELEVAT64.EXE + ELEVATE.EXE (included in 10_BLOCK.ZIP). STOP!DNS.CMD = Batch Command (CMD) file ➜ Stop DNS Client service CMD (Windows Command Script). STARTDNS.CMD = Batch Command (CMD) file ➜ Start DNS Client service CMD (Windows Command Script). List of files inside 10_BLOCK.ZIP archive. Complete list of files in 10_BLOCK directory. MDGx Win10 Block Tools (10_BLOCK) are also part of W95-11D.EXE + W95-11D.ZIP. 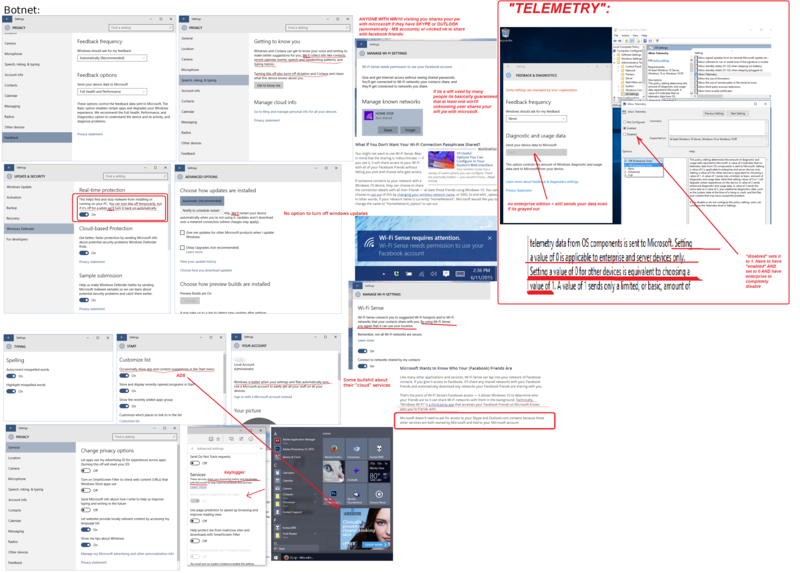 Comparison of Windows 10 Privacy tools. Windows 10 looks like this. 10_BLOCK.TXT = ReadMe Text (TXT) Guide ➜ must view 1st! This ReadMe TXT Guide => must view 1st! 2. Open Explorer -> Downloads folder (default location) -> right-click 10_BLOCK.CMD -> Run as Administrator -> restart Windows. reduced rights (below Administrator level), to ensure all fixes work properly. CMD, REG, VBS) with the Explorer/shortcut right-click "Run as Administrator"
2. Open Explorer -> right-click "I Don't Want Windows 10.exe" (Application) -> Run as Administrator. Open Explorer -> right-click "disablewintracking.exe" (Application) -> Run as Administrator -> check "Privacy" -> press Go. Open Explorer -> right-click "DWS_Lite.exe" (Application) -> Run as Administrator. Open Explorer -> right-click "OOSU10.exe" (Application) -> Run as Administrator. 2. Open Explorer -> right-click "Win10 Spy Disabler" shortcut inside installed folder -> Run as Administrator -> select options. 2. Open Explorer -> right-click "Windows Privacy Tweaker.exe" (Application) -> Run as Administrator. 2. Open Explorer -> right-click "W10Privacy.exe" (Application) -> Run as Administrator. 2. Open Explorer -> right-click "Win.Privacy.exe" (Application) -> Run as Administrator. 2. Open Explorer -> right-click "WinPurify.exe" (Application) -> Run as Administrator. Open Explorer -> right-click "SDAntiBeacon-1.5.exe" (Application) -> Run as Administrator. Open Explorer -> right-click "Ashampoo_AntiSpy.exe" (Application) -> Run as Administrator. Open Explorer -> right-click "win10spystop-x32-setup.exe" (Application) -> Run as Administrator. 1. Open Explorer -> right-click "DoNotSpy10-1.1.0.0-Setup.exe" (Application) -> Run as Administrator. 2. Open Explorer -> right-click "DoNotSpy10" shortcut inside installed folder -> Run as Administrator -> select options. Open Explorer -> right-click "never10.exe" (Application) -> Run as Administrator. 1. Burn "Windows 10 Rollback Utility.iso" (ISO File) on blank/empty CD-R/DVD-R/BD-R/USB media. 3. Follow instructions to revert (roll) back to previous Windows 7/8/8.1 OS (if any). 2. Open Explorer -> right-click "aegis.cmd" (Windows Command Script) -> Run as Administrator. 1. Open Explorer -> right-click "GwxControlPanelSetup.exe" (Application) -> Run as Administrator. 2. Open Explorer -> right-click "GWX Control Panel" shortcut inside installed folder -> Run as Administrator -> select options. 2. Open Explorer -> right-click "10AppsManager.exe" (Application) -> Run as Administrator. 2. Open Explorer -> right-click "WindowsXAppRemover.exe" (Application) -> Run as Administrator. 2. Open Explorer -> right-click "Uninstall Cortana.cmd" (Windows Command Script) -> Run as Administrator. 2. Open Explorer -> right-click "EdgeBlock.exe" (Application) -> Run as Administrator. run PowerShell as Administrator -> run all included scripts -> restart computer. 2. Open Explorer -> right-click "blackbird.exe" (Application) -> Run as Administrator. Is Windows 10 really a privacy nightmare? How Bad Is Microsoft's Data Land-Grab? Windows 10: which services to disable? gpedit.msc] from all Home and Starter Editions of Windows XP/Vista/7/8/8.1/10/2016! 2. Open Explorer -> right-click "setup.exe" (Application) -> Run as Administrator. 3. Start -> select Run... (hold WinKey + press R) -> type gpedit.msc -> OK/Enter -> select Policy to change. - Personalized ads in this browser. - Personalized ads wherever I use my Microsoft account. - Companies Customizing Ads For Your Browser. 03. UNcheck all boxes + turn OFF all switches. 05. UNcheck all boxes + turn OFF all switches related to ads, tracking, history. 07. Turn OFF the switch to make sure "Ad personalization is OFF". 09. Wait for browser detection to complete [may take a while! ;-(] = 100%. 10. Click "Opt Out? select all" (top right) or "OPT OUT OF ALL" (bottom). 11. Wait for browser detection to complete [total 134 opt-out requests] = 100%. 12. Click "View Updated Results" = make sure all boxes are UNchecked. 2. Follow instructions to disable (opt out of) all ads + tracking. order to strengthen your Mozilla web browser's security. Windows Update (WU) and/or some other Microsoft programs/features/services/etc you may need or care about. View your specific programs/features/services/etc documentation to learn how to allow/enable/use them properly. -> comment/remark (precede with #) or delete desired line(s) below -> refresh/restart your app(s)/browser(s). # Lines below recommended to disable almost *everything* Microsoft => use with CAUTION! :: Must see 10_BLOCK.TXT (included) for guidelines! :: ECHO You are not logged in as Administrator! :: ECHO You MUST: Open Explorer -> right-click this file -> Run as Administrator. :: Windows Update (WU) and/or other Microsoft programs/features/services/etc you may need or care about. :: View your specific programs/features/services/etc documentation to learn how to allow/enable/use them properly. IF EXIST "%windir%\SYSTEM32\DRIVERS\ETC\HOSTS" DEL /F /Q "%windir%\SYSTEM32\DRIVERS\ETC\HOSTS"
IF EXIST "%windir%\SysWOW64\DRIVERS\ETC\HOSTS" DEL /F /Q "%windir%\SysWOW64\DRIVERS\ETC\HOSTS"